Gabriel Jesus struck at the death to cap City’s remarkable season. Champions Manchester City became the first club to amass 100 Premier League points after Gabriel Jesus scored a dramatic stoppage-time winner at Southampton. 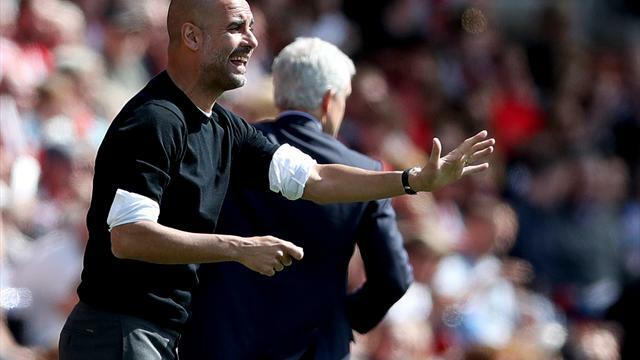 Pep Guardiola’s record-breaking side looked like missing out on an historic win on the south coast before substitute Jesus lobbed home to secure a 1-0 success with almost the final kick of the game. Struggling Saints knew before kick-off that only a highly unlikely 10-goal swing in goal difference could send them down and a defeat for relegation rivals Swansea meant they were never in serious danger of the drop. In a season when City scored so many late winners – including a Raheem Sterling goal in the sixth minute of stoppage time in the reverse fixture against Southampton – it seemed fitting they should reach 100 points with virtually the last kick of the season. And Jesus seemed the most likely man to do it. City started the match without an out-and-out striker but whereas it has worked for them in the past, they needed the introduction of Jesus on the hour mark to step up their threat. There was only one worth remembering. With the three added minutes all but up, Kevin De Bruyne launched a long ball over the top for Jesus, who took one touch before casually lifting the ball over the helpless Alex McCarthy to spark huge celebrations in the City end and on the bench. Pep Guardiola has always said places in his side are never given but always earned. However, he showed another side in the final 15 minutes as both Brahim Diaz and Phil Foden were brought on – giving each player a fifth appearance of the season to earn a Premier League winners’ medal. That made Foden the youngest ever winner of a Premier League medal at the age of 17 years and 350 days, overtaking Gael Clichy, then of Arsenal. Man City: Claudio Bravo 5, Danilo 5, John Stones 6, Aymeric Laporte 7, Fabian Delph 6, Kevin De Bruyne 7, Fernandinho 7, Ilkay Gundogan 7, Raheem Sterling 6, Bernardo Silva 7, Leroy Sane 6. Substitutes: Gabriel Jesus (for Delph, 59) 8, Brahim Diaz (for Silva, 78) 6, Phil Foden (for Gundogan, 82) 7.